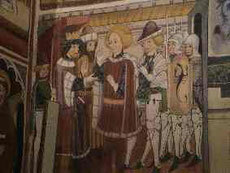 Itinerari inglese - Benvenuti su colpodipedale! 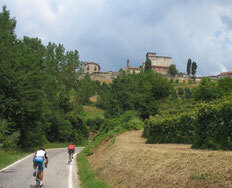 The tours take place in the magnificent countryside around Barolo pedal through quiet roads and magnificent views through the vineyards and castles of Barolo, La Morra, Verduno, Novello. You will discover the Barolo hills and the villages where life proceeds in a natural balance between nature, art ad culture. The terrain is mostly rolling to hilly with climbs ranging from 4 to 7 km in length. Pedal in the crestline roads of Alta Langa, visiting Mondovi Piazza and the Monregalese, Vicoforte Sanctuary, San Fiorenzo chapel at Bastia, the St Mary of Pesio's Carthusian monastero, this quiet and uncontaminated corner of Piemonte offers splendid scenery, fertile valleys, peaceful, forests, hazel trees, quiet roads. 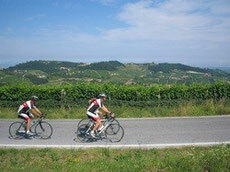 We ride through some of the Piemonte’s most beautiful landscapes. 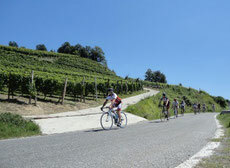 Ride through the vineyards of the wine Dolcetto, Barbera, Nebbiolo, Barolo, Barbaresco, through the castles of Grinzane Cavour, Serralunga d’Alba, Castiglion Falletto, magnificent views, panoramic terrace of the wine country. On secondary roads cyclists will cycle between climbs and the crest of the hills, these routes are medium - high difficulty with little plain and much altitude. The terrain is mostly rolling to hilly with climbs ranging from 4 to 7 km in length. Barbaresco is a name synonymous with great wine, our bike tour takes us on a breathtaking cycle through the hills of Barbaresco passing vineyards, ancient and peaceful villages, and for the passionate gastronomy the possibility to discover the savor of Piedmont's fine wine and sophisticated cuisine. The terrain is mostly rolling to hilly with climbs ranging from 4 to 7 km in length. In these easy itineraries of the sweet hills of Roero you can cycle between the typical geological formations "Le Rocche", reaching the castles and the towers of Guarene, Castellinaldo, Magliano Alfieri, Govone, Vezza d' Alba, Baldissero, Guarene, Ponticello d’Alba, Santa Vittoria. 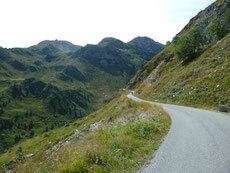 The terrain is mostly rolling to hilly with climbs ranging from 2 to 4 km in length. Peaceful countryside, small medieval art towns, wines and white truffles, sophisticated cuisine, the hills of the Langhe, located southeast of Turin in Piedmont, delight all five senses. 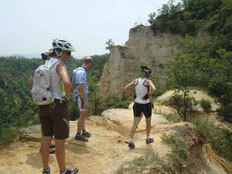 Each Tour is designed to suit your personal needs, the excursions are "personalized", we design itineraries considering the requirements and the athletic condition of the participants, the distances can be "easy" for who is not cycling habitually, of "medium difficulty" for who has a minimum of training and for who is very trained long cycling sessions are provided between the climbs of the Langa, high Langa and Monregalese.